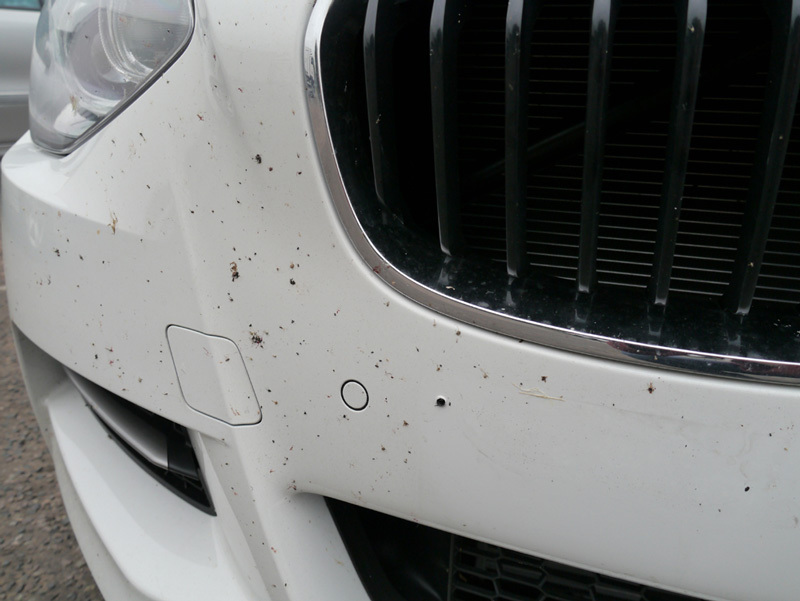 Contamination affects both brand new and used cars and takes many forms – tar, metal particles, tree sap. These everyday contaminants bond readily to car surfaces and have the potential to cause damage to paintwork and wheels, so their removal is vital to the health and appearance of any vehicle. Ideally contamination should be removed using non-contact methods in order to prevent any accidental scratching or marring of paintwork. The decontamination stages are best completed in order, one immediately after the other. Do not allow water to dry naturally on the car (unless of course you are using a de-ionising filter) otherwise you will incur water marks which are difficult to remove. If all the steps cannot be completed one after the other, dry the car with a soft, clean drying towel. Iron and other metal particles are mainly derived from brake dust and as such can be hot. This makes it easier for them to embed themselves into paintwork and as they cool, the particles harden onto the surface and if left will cause damage to the clear coat. To remove them effectively it is advisable to use a cleaner specific for the job, known as ‘iron contamination removers’, or ‘fallout removers’. These types of cleaner work to neutralise and shrink the metal particles, causing them to break the bond with the surface and thus allowing them to be safely rinsed away. Typically these cleaners will have a colour change function to allow you to visualise the cleaner working. Tar, tree sap and bug residue all bond as if ‘Super-Glued’ to the surfaces of vehicles. There are cleaners specifically designed to tackle this type of contamination, typically called ‘bug and tar removers’ or ‘adhesive removers’. Some of these products will turn non-painted plastic trim and window rubbers milky white and cause pitting on metals used on grilles and badges, so it’s advisable to protect these first with detailing tape. 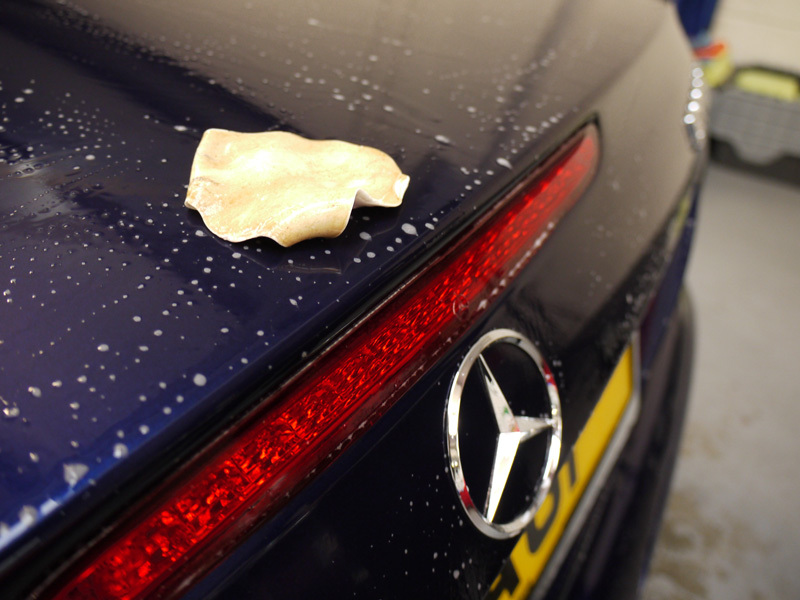 In an attempt to protect new cars from rusting and contamination build-up during transit from the factory to the dealership, a thick, protective wax is applied. When removed it leaves behind a tacky residue which is hard to remove. Left on the car this sticky residue attracts more contaminants which bond extremely well with the layer and the whole surface becomes extremely difficult to decontaminate. Using a strong adhesive remover will remove the remnants of sticky wax before build up occurs. Strong adhesive removers will typically leave milky white staining on non-painted plastic trim and cause pitting on metal details, so it is strongly advised to protect these areas with detailing tape prior to application. Engine bays tend to become greasy and oily quite quickly and grease and oil attract dirt and grime. Clean engines look more impressive to potential buyers than dirty engines, so keeping on top of the build-up is important. Additionally the cleaning process allows you to check for any obvious signs of wear, such as split hoses or damaged components. The first part of any engine clean is to ensure all sensitive engine components are protected from water ingress. Air intake – you don’t want water in the breathing pipes! ECU – Electronic Control Unit – electricity and water do not mix. Battery connections – just to prevent rust formation. Electric plugs – electricity and water do not mix! Alternator – it’s the electrical power house for your car. Alarm housing – sensitive electronics tend to short circuit on contact with water. Headlamp connections – you do not want water collecting inside the headlamp housing. Step 1 – Make sure the engine is completely cool before attempting to wrap the components! Step 2 – Using detailing tape and some cling film cover the smaller electrical components such as plugs, battery connections and connections for headlamps. Step 3 – Larger items such as the ECU and alternator are more easily covered using plastic carrier bags. If the bags have holes punched in them, use two bags. Whilst the seal doesn’t have to be 100% water tight as the engine is not going to be immersed in water, you do not want to pour water directly in through one of those holes. Step 4 – Remember, when covering the sensitive components the finished article does not have to look aesthetically pleasing – it’s better to have them wrapped properly and not risk mixing water into a vital part of the engine. Step 6 – Using a spray / shower setting on a hose attachment, gently rinse off the engine bay. Do not use high pressure as this may force water and loosened contaminants in to the wrong areas! 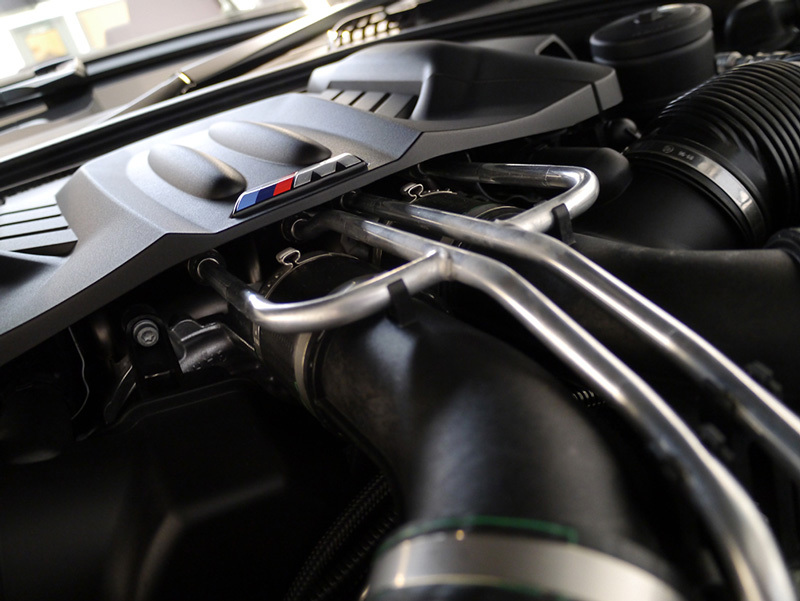 Engine bays hold a variety of materials – painted metal, unpainted metal, rubber hoses and plastic housings. Each requires a different type of dressing to nourish and protect their appearance. Painted metal can be protected using a designated protectant, usually called an engine dressing. A non-silicon based dressing is best as these do not leave a residue to attract dirt and dust. 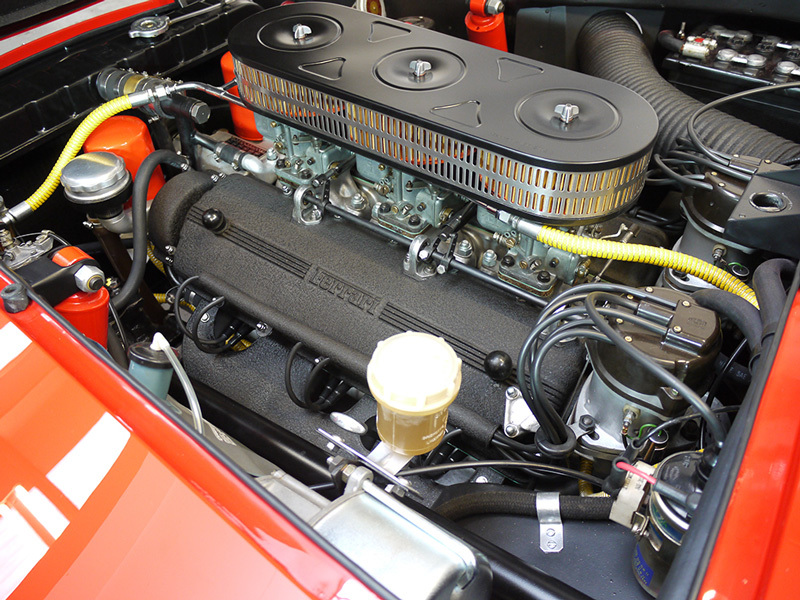 There are a variety of engine bay dressing available and typically these require nothing more than spraying over the desired areas and a few minutes of curing time. Unpainted metal should be protected with a specific treatment to discourage rust formation and to help prevent dirt from adhering to it. These treatments can typically be sprayed on to the area or applied with a brush and then left to cure for a few hours. Rubber hoses should be protected with a product specifically designed for natural rubber, (rather than a plastics dressing as plastics are synthetic and therefore have different requirements). Plastic housings should be treated with a plastics restorer. There are standard plastic dressings available which are simply sprayed on and buffed off, additionally there are nanotechnology-based coatings available. Whether you have a cabriolet fabric roof or a vinyl hard top, environmental fallout and road grime will collect on the roof and will therefore require attention. In certain conditions, such as when stored in a damp and dark garage or permanently in shade, mildew growth can also be an issue. Contaminants in rain, bird droppings, road tar and dirt all combine to embed into soft tops and textured vinyl which left untreated will cause unsightly marks and eventually affect their performance. This makes periodic cleaning of cabriolet and convertible roofs an absolute must in order to preserve water proof performance and their ability to protect against harmful UV rays. Cleaning a soft top is imperative to maintain the function of the material as well as the overall appearance of the car. Due to the sensitive nature of the material, it’s best to opt for a cleaner specific to the job to ensure any chemicals in the cleaner will not adversely affect the colour of the fabric. It is important to note that thorough rinsing is absolutely vital as any cleaner residue may cause staining on the cabriolet’s fabric roof. 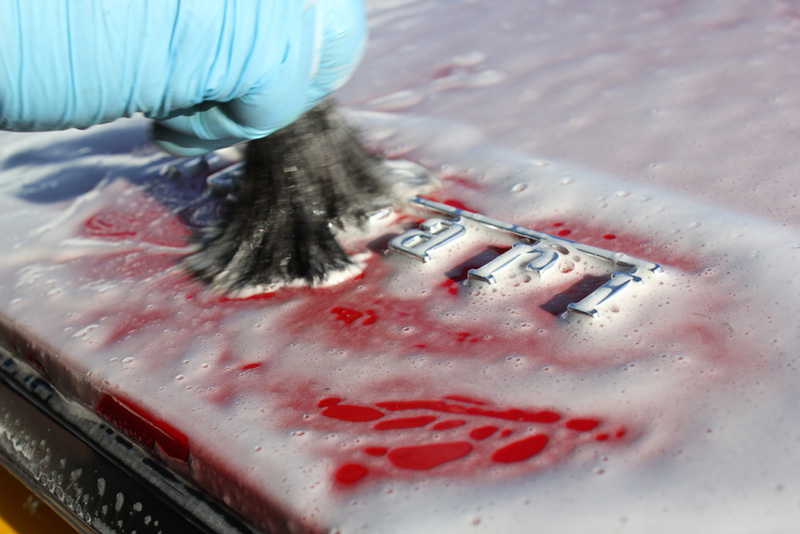 Step 2 – Spray the cleaner over the soft top paying particular attention to any specific problem areas, i.e. bird dropping staining, mildew growth, etc. 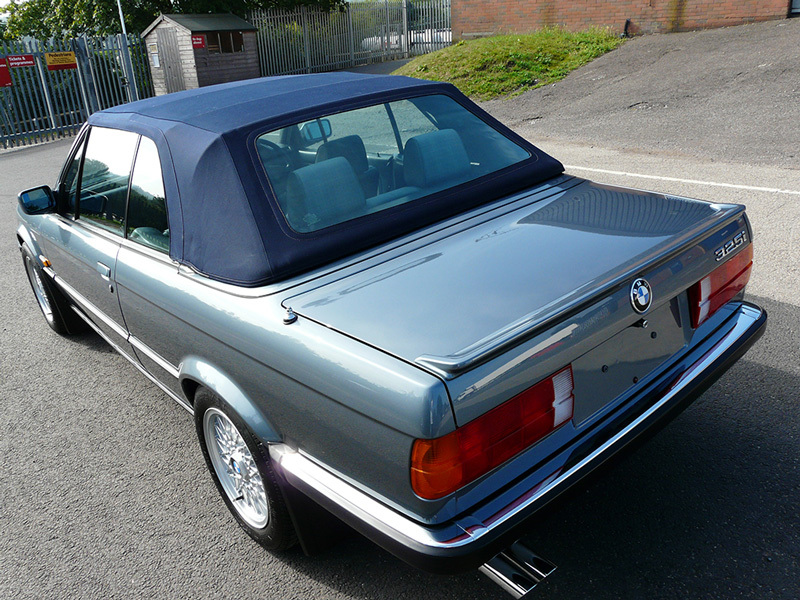 Drying a cabriolet soft top is absolutely vital prior to applying a water proofer or fabric sealant. Once a final step product has been applied any moisture remaining in the soft top will become trapped causing the material to rot and disintegrate from the inside. Residual moisture will also encourage the formation of mildew. Leave the vehicle in sunshine with the soft top in the ‘up’ position for a few hours (the air temperature and humidity will affect evaporation times). Do not leave the soft top in sunshine for longer than necessary as the material is yet to be protected (see 3.3. 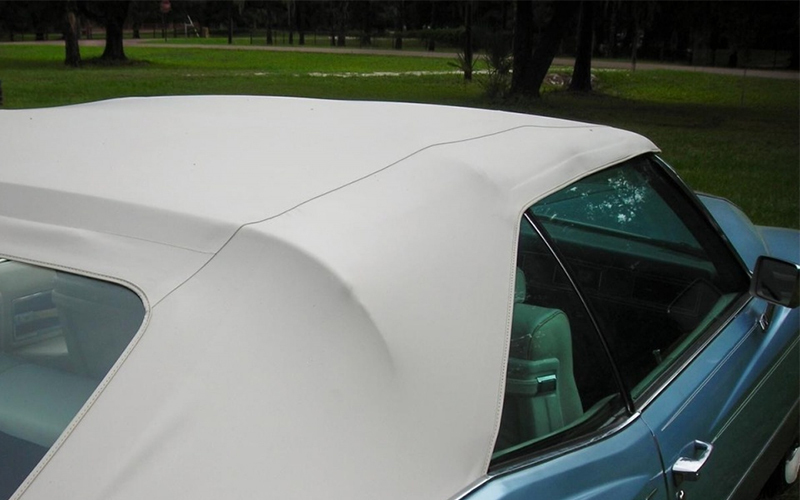 Protecting & Sealing Cabriolet Fabric Roofs). Of course, a combination of any of the above can be used, for example, allowing the soft top to dry in the garage overnight, then ensuring it is completely dry by using a hair dryer for a few minutes. Once your soft top is clean and completely dry, the important last step is to protect the surface from water ingress, colour fade as a result of UV rays and staining from environmental fallout. Most sealants will re-weatherproof and offer UV protection in one product. Most products are not harmful to trim or windows, but if in doubt use detailing masking tape to protect any sensitive areas. Note: This article refers to vinyl roofs. For painted hard top roofs such as those found on convertibles where the roof retracts into the boot, please see articles on paintwork care. The textured nature of some convertible vinyl roofs means dirt and grime become embedded in the grain and can be tricky to remove. Whilst All Purpose Cleaners will work to remove these contaminants, their formulation can be quite strong, so sticking to products specifically formulated to treat convertible roofs is recommended in order to prevent premature fading of the vinyl. Most vinyl roofs are inherently waterproof but they still require protection from UV rays, otherwise the colour may start to fade. Resist the temptation to use trim dressings as typically these products contain silicones, plasticisers and petroleum distillates which can magnify the effects of the sun, particularly as the roof is in prime ‘sun bathing’ position! Mohair soft tops are inherently sensitive but this doesn’t prevent chemical fallout raining down on them or birds from depositing their business – it just makes cleaning them a little more delicate. Dust collects in the weave and over time can start to weaken the fabric so it’s important to ensure this is removed periodically. The easiest way to do this is with a vacuum cleaner but care should be taken with classic vehicles where the mohair is ‘fluffier’ – vacuuming may not be advisable as it may pull too strongly at the weave. A protectant can take the form of a trigger spray, aerosol or a paint-on product. Spray on products are faster to use but there is the question of overspray particularly if you’re applying it outside and it’s a bit breezy! Paint-on products give you more control over application but take longer to apply. 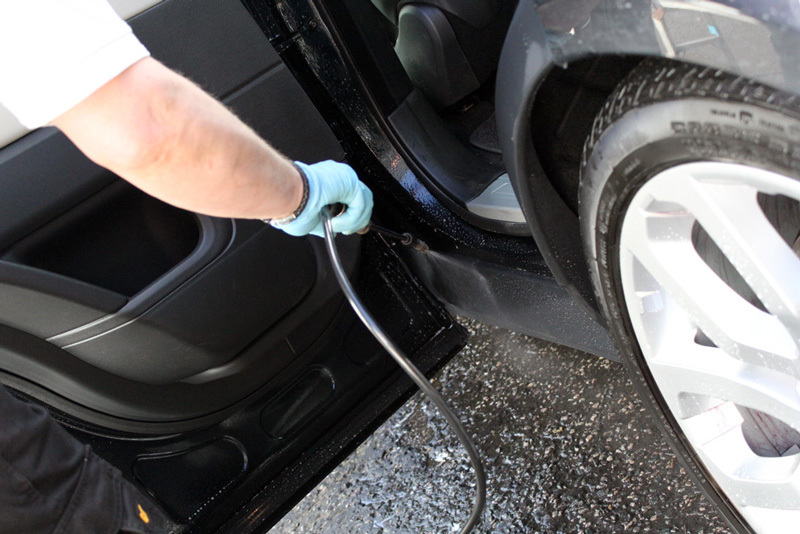 Pre-washing using a high foaming product is essential for the health of your paintwork. Pre-wash products typically create thick foam designed to lift larger dirt particles and grit away from the surface of the paint allowing them to be safely rinsed away. By employing this type of non-contact pre-wash, the chances of introducing scratches and swirls at the wash stage are significantly reduced. In all cases pre-wash solutions are best applied to a dry surface to allow the foam to dwell on the surface and work more effectively. Pre-wash products rely on pressure to create a thick, clinging foam. The higher the pressure the thicker and therefore the more effective the foam will be at lifting dirt and grit. Using a pre-wash solution with a foam lance connected to a pressure washer is always going to produce a thicker foam than when using a foam gun connected to a hosepipe. Pre-wash cleaners, also known as ‘snow foam’ are designed to dwell on the surface longer than standard shampoos. The foam is created using a combination of a high foaming product and pressure. Pump spray bottles and spray guns attached to hosepipes create less pressure than foam lances connected to pressure washers, therefore the foam tends to be less thick. Most foam guns have a mixer dial which allows the user to alter the water to product ratio, creating thicker or thinner foam as desired. Using a pre-wash is an ideal, non-contact method of removing potential harmful larger particles of dirt, helping to prevent swirls and scratches during the wash process. Most pre-wash cleaners are not harmful to cabriolet soft tops, so getting a small amount of product onto a soft top is generally not a problem. However, for cleaning a soft top correctly it is advisable to use products specifically designed for the purpose, in order to ensure colour and performance of the material is not affected. 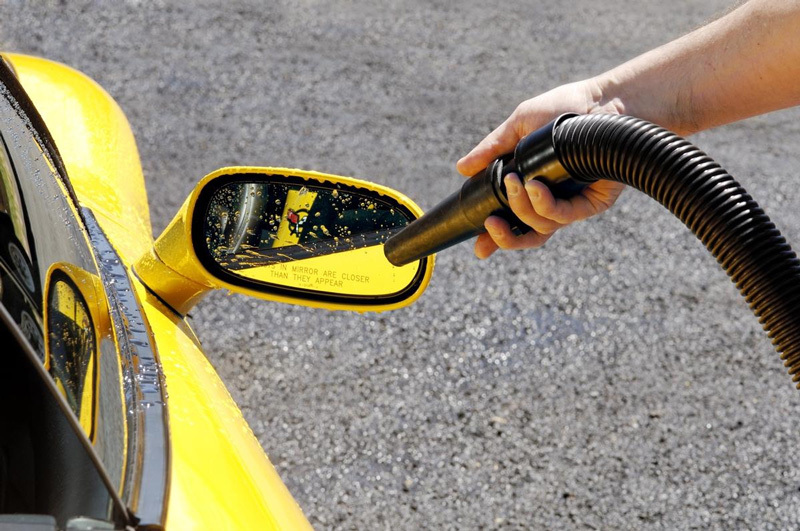 Using a pre-wash cleaner (also known as ‘snow foam’) applied through a foam lance connected to a pressure washer ensures the creation of thick foam able to cling to the vertical surfaces of a car for several minutes. This gives the foam maximum opportunity to get under larger particles of dirt and grit, lifting them away from the surface of the car and allowing them to be safely rinsed away. Most foam lances have a mixer dial, allowing the user to control the product to water ratio, giving thicker or thinner foam as desired. Many foam lances also have a twist mechanism to change the angle of the foam jet from horizontal to vertical. Pre-wash cleaners, also known as ‘snow foam’ are available as either pH-neutral or alkaline formulations. Some professional or ‘trade’ pre-wash cleaners, such as those typically found at the local hand car wash tend to be quite caustic, having a pH of 10 or above. Highly alkaline cleaners have the ability to strip protective wax layers and degrade sealants; even nanotechnology-based glass coatings can be degraded by highly caustic chemicals. ‘Consumer’ pre-wash cleaners tend to be only mildly alkaline and at this level they have little or no impact at all on wax or sealant layers. It’s more common to strip wax layers by standing too close to a vehicle with a high pressure jet than by using a ‘consumer’ pre-wash cleaner. 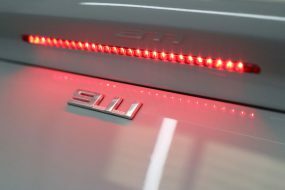 Clearly, pH-neutral pre-wash cleaners will have the least impact on existing protective layers, however they must rely solely on surfactants to remove contamination from the vehicle and as a result tend to be less effective. Most ‘consumer’ pre-wash cleaners are not harmful to cabriolet soft tops, so getting some product onto a soft top is generally not a problem. However for cleaning a soft top it is advisable to use products specifically designed for the purpose, in order to ensure colour and performance of the material is not affected. 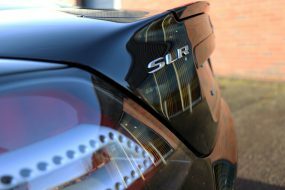 Washing your vehicle regularly is an essential part of caring for the visual appearance of your car, but it’s also the most likely time to accidentally inflict swirls into the paintwork. Safe washing techniques must be employed to avoid accidental swirling and micro-scratches, as these build up over time and before too long, the paintwork looks irretrievably dull and tired. As well as being disappointing for the owner, dull paintwork is likely to significantly reduce the resale value of any car. 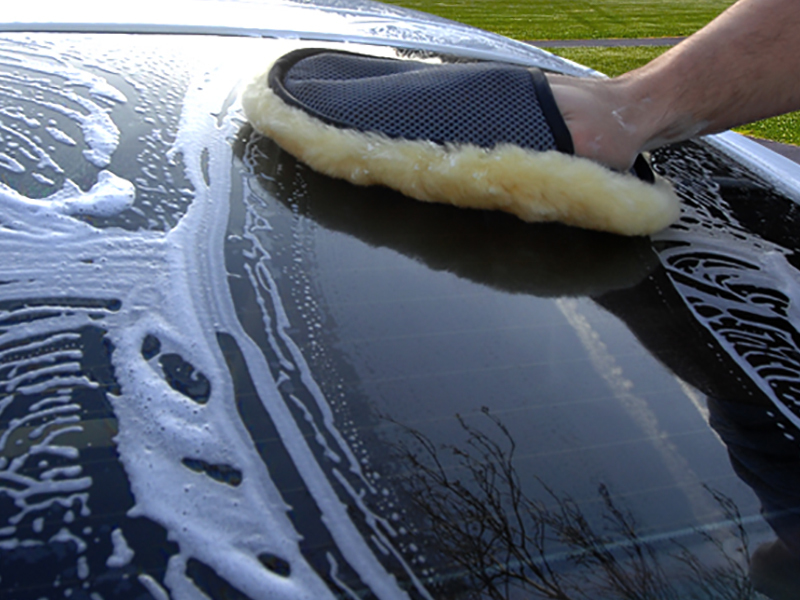 Traditional sponges are no longer the preferred tool of the car care professional and for good reason: the open cell nature of most foam sponges traps grit and dirt at the surface of the pad, allowing the contamination to be repeatedly wiped over the bodywork as the wash progresses. 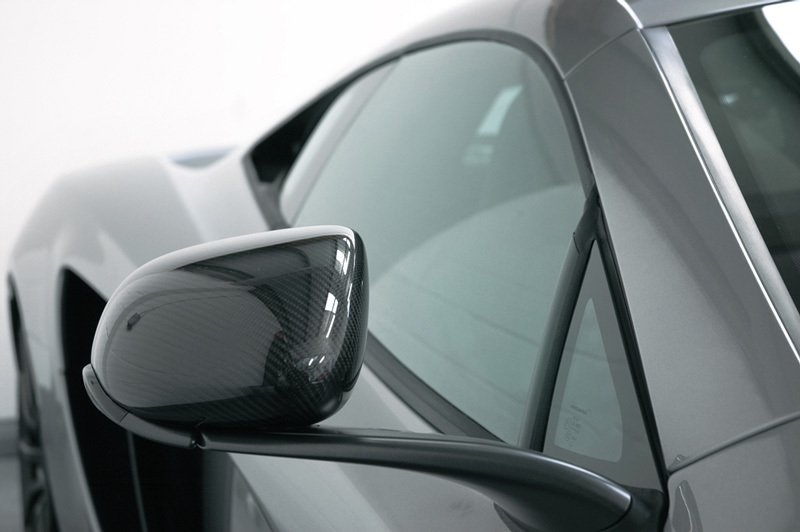 These dirt and grit particles leave scratches and swirls in the bodywork – the larger the grit the worse the swirls. The marring left behind on the paintwork is clearly visible particularly in bright sunlight and the circular pattern leaves no doubt as to when and how they were inflicted. To avoid this opt for either a wash mitt or a wash pad. Favoured by the majority as mitts fit over the hand and secures with a cuff over the wrist. Rather than having to grip on to a pad, a mitt allows the user to relax their hand during the wash process, preventing cramping. It also makes it less likely that the mitt will be dropped on the floor during the wash process, thus avoiding contamination. There are 2 types of mitt: the microfibre and the natural wool, be it lambswool or Merino wool. Being synthetic, the microfibre mitts are the easiest to maintain – most can be machine washed and then put out to dry. Providing the pile is long, microfibre mitts are a great option – the long pile removes dirt from the car’s bodywork and traps it deep inside, making it less likely to incur swirl marks. Natural mitts are very popular too – the natural fibres are very soft (Merino wool mitts particularly) and again, the long fibres remove dirt and trap it deep in the pile. Natural wool mitts however require better care, typically cannot be machine washed and, depending on how long the fibres are, may even need combing out! They are also more inclined to rot and disintegrate if they’re not maintained properly. Most wash pads are a microfibre overlay with a sponge centre. This means they are easy to grip and easy to look after. They tend to be highly absorbent (although this depends on the quality of the underlying sponge). Again, look for a long pile microfibre covering as this is all important for isolating and the subsequent removal of dirt particles. 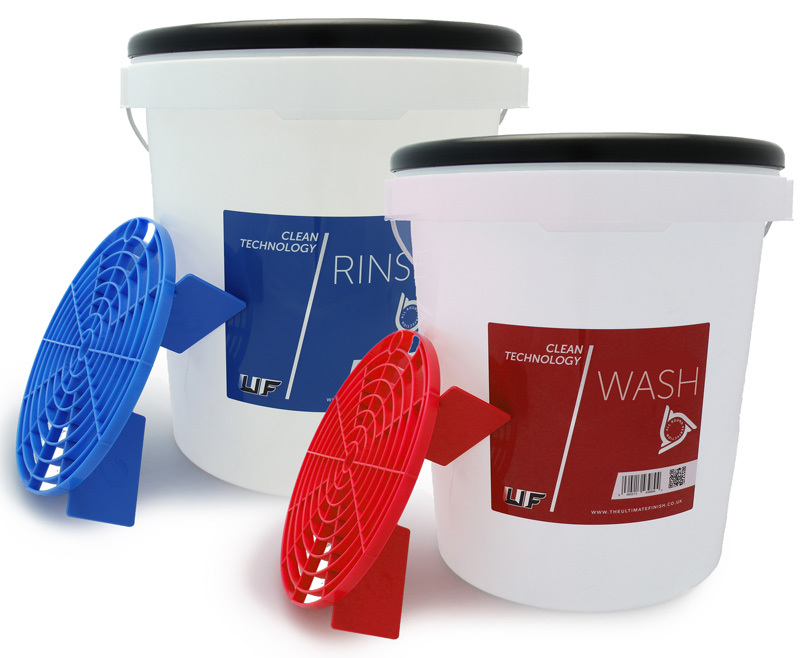 The tried and tested ‘Two Bucket Method’ is an excellent way to minimise the chances of inflicting swirl marks and scratches into the paintwork during the wash process by separating the ‘wash’ water from the ‘rinse’ water. Ideally, a grit guard or scratch shield should be placed in the bottom of the buckets; this allows you to brush your mitt against it, releasing dirt particles which sink to the bottom of the bucket. The guard then helps keep the grit at the bottom of the bucket. 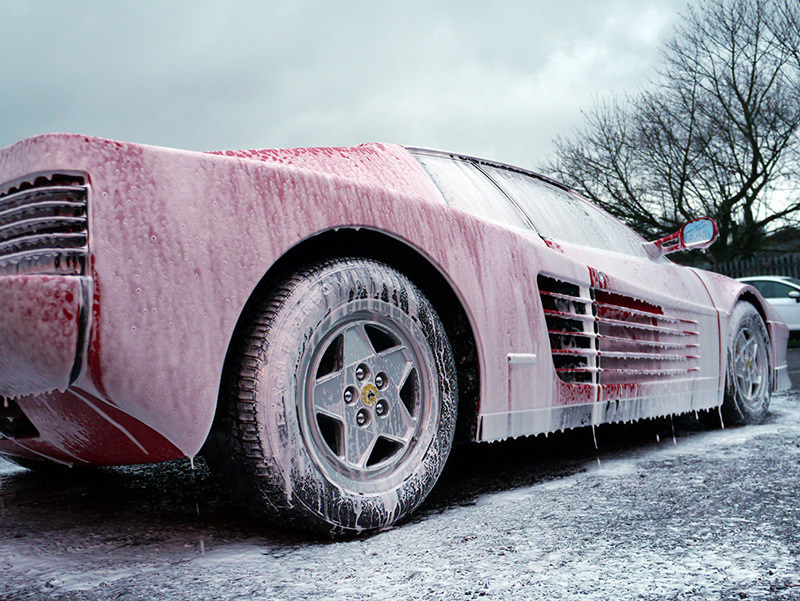 Step 10 – Repeat until your car is clean. You will notice the water in the Wash Bucket stays clean whilst the water in the Rinse Bucket will turn dark and murky. Change the rinse water as often as necessary to prevent contaminating the wash water. 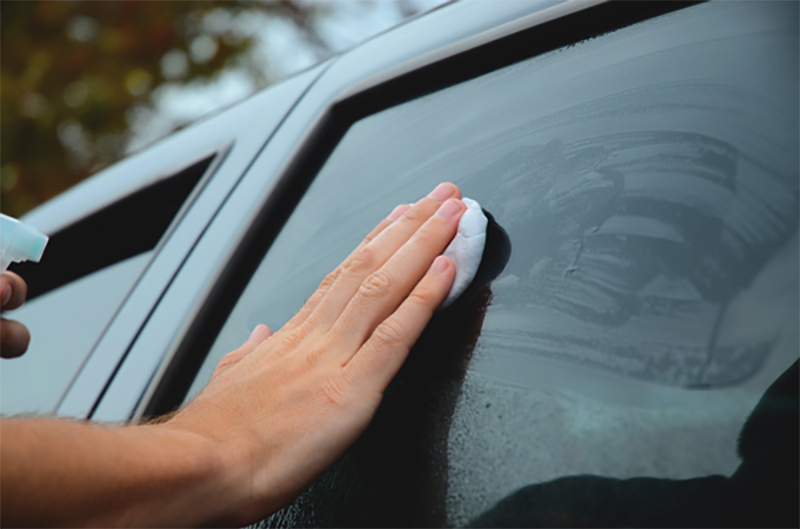 It’s worth noting – wheels, sills and the rear of the vehicle tend to collect the worst of the road grime and it’s a good idea to keep a separate wash mitt specifically for these areas. Grit Guards / Scratch Shields are grilles placed in the bottom of a bucket to provide a surface to rub a wash mitt or wash pad against. This action releases trapped dirt and grit particles from the wash mitt or pad which then sink through the grille to the bottom of the bucket and are less likely to re-contaminate the wash mitt or wash pad. There are several types of grille available – some are fixed and suit a particular size of bucket, others have detachable ‘feet’ and so can be altered fit buckets of differing diameters. Whichever you opt for, a grille of this kind is a key piece of the ‘safe washing’ kit and come highly recommended. Wheels and tyres have a significant impact on the overall appearance of your car. 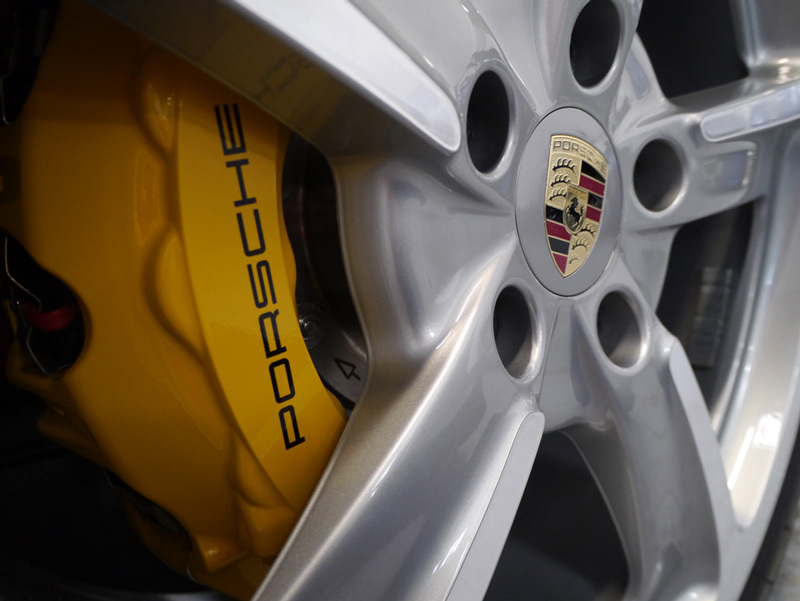 Alloy wheels tend to be sensitive to harsh chemicals and can be scratched by stiff bristles. Typically alloys are expensive to replace, so keeping them in good condition is a worthwhile investment. Tyres also take the brunt of road conditions and are subjected to different types of dressing, many of them silicone-based. Over time these types of dressing cause a build-up of brown residue which apart from being unsightly can can also impact the longevity of the tyre. Keeping wheels clean is an on-going battle, as inevitably they collect an enormous amount of road grime, tar and harmful brake dust. 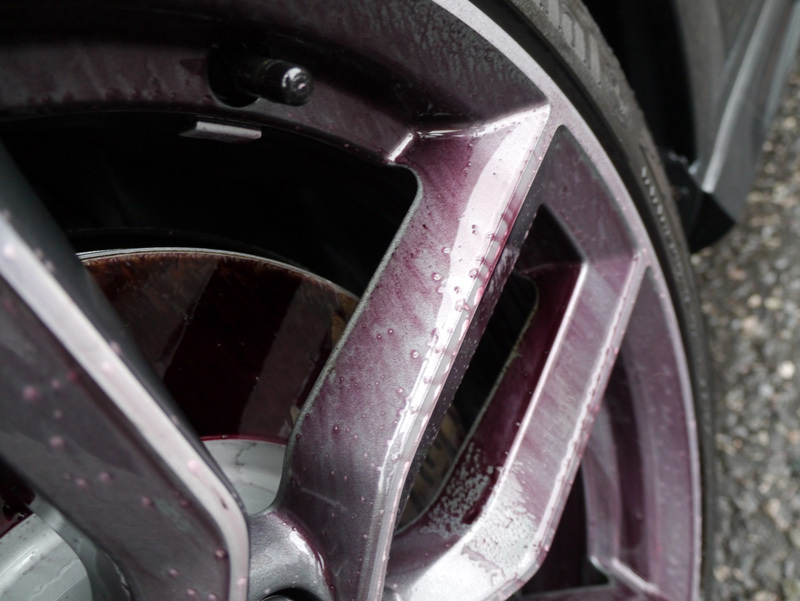 The temptation may be to use a caustic wheel cleaner to remove these contaminants quickly, but using strong chemicals is very likely to degrade the surface over time and if left for too long on the wheel during the cleaning process will compromise the lacquer and eventually cause it to peel – requiring a complete and expensive wheel refurbishment! 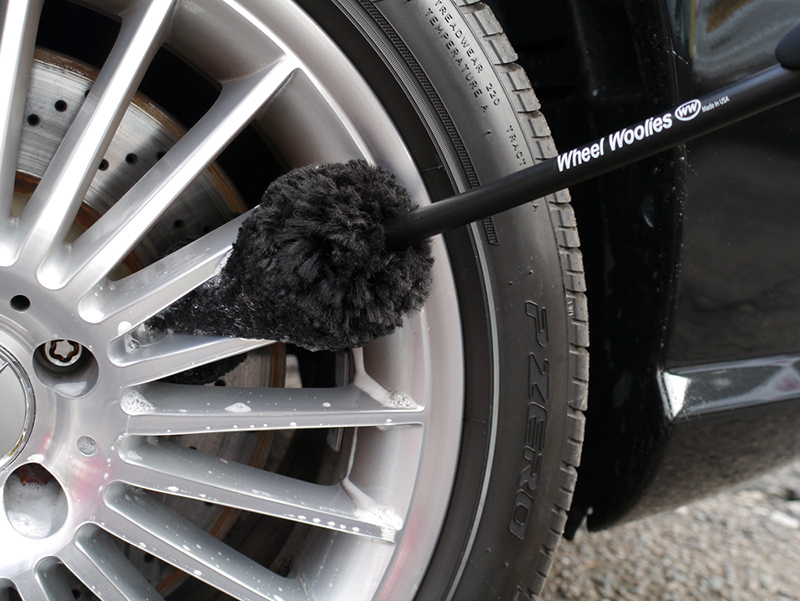 The key to keeping wheels in pristine condition is to clean them regularly to avoid the need for strong cleaners. 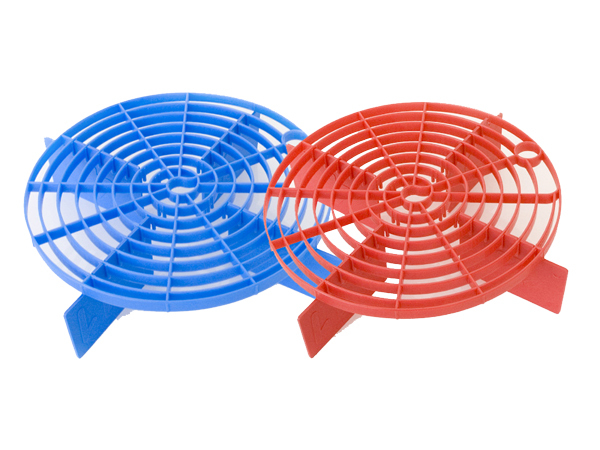 Using a pH-balanced wheel cleaner is ideal although their lack of bite will mean contaminants that have been allowed to bake on to the wheel will require agitation with a brush in order to dislodge them. Cleaners with a slight alkaline or acid bias will remove these trouble spots more easily. Some wheel cleaners have a colour-change function which helps to see that it is working. If contamination is particularly evident or after a long drive where the brakes have been used extensively, it may be necessary to use an Iron Contamination or Fallout Remover (refer to 1.1 Safe Removal of Metal Particles). Never clean wheels whilst they are hot! It is extremely important to ensure wheels are cool to the touch before beginning the cleaning process. Any wheel cleaner will evaporate if sprayed on to a hot wheel. Even worse, if the cleaner has an alkaline or acid-base, the reaction between the chemicals in the cleaner and the heat of the wheel could cause permanent etching in the lacquer. Many tyre dressings contain silicones that leave a build-up of residue which turns tyres brown. In order to restore tyres to their natural satin black, it is necessary to strip off the old remnants of tyre dressing to reveal the original rubber surface. 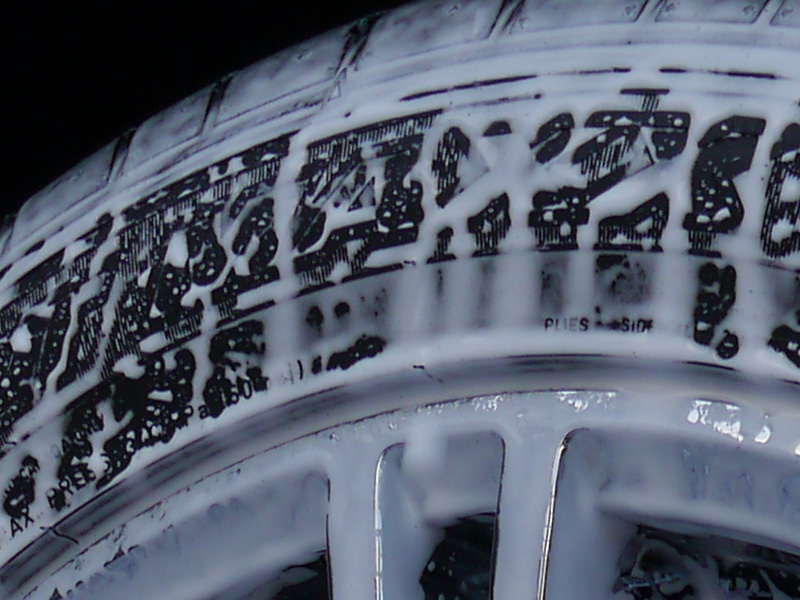 There are specific tyre cleaners available for cleaning tyres, however an effective (but preferably not too astringent) All Purpose Cleaner will work just as effectively. Inevitably tyre cleaner is going to be transferred onto the wheel during cleaning, so it’s important both tyre and wheel are cool to the touch in order to prevent any etching from a chemical/heat reaction. Once tyres have been cleaned and old tyre dressings have been removed, applying a good tyre dressing finishes off the look perfectly. Some tyre dressings are solvent based and some are water based. Solvent based dressings work by opening the pores of the rubber to impregnate them with colour. They tend to be longer-lasting and more water repellent. However some use lesser quality solvents which can damage tyres and all of these dressings tend to attract more dust as they are typically a thicker, stickier formulation. They can also be considerably more difficult to remove when you want to clean the tyres and start again. Water based dressings tend not to last as long and are prone to sling as they’re not as thick as the solvent based products. Both water based dressings and solvent based dressings may contain silicones and so both types have the potential to turn tyres brown, so if you’re aiming for a silicone-free dressing you will need to check the ingredients first, rather than relying on the description of ‘water based’. It’s worth bearing in mind that dressings containing silicones must not come into contact with tyre tread as it will make lose grip and become slippery, particularly in the wet. There are two different types of finish to choose between – a high gloss look or a natural satin sheen. Whichever you opt for is entirely down to personal choice, but note the shinier the dressing, typically the higher the silicone content. Tyre dressings come in a variety of formulations – wipe on with a foam applicator (some are contoured specifically to make tyre dressing application easier), spray on / trigger head bottle or in a tub which require you to paint it on with what looks like a paint brush. 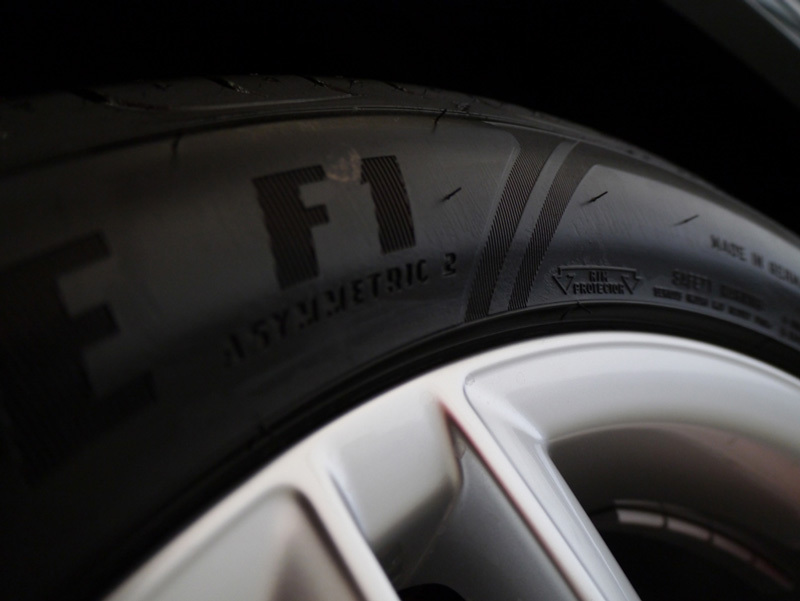 Typically tyre dressings can also be used on the under-side of wheel arches, for those who wish to be thorough. 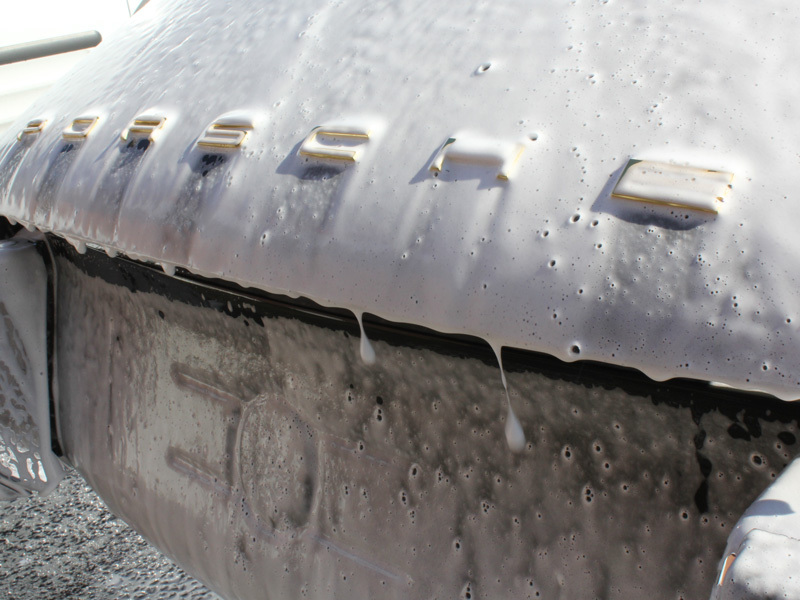 Rinsing your vehicle after washing may seem obvious and easy – and so it should be! However, there are important factors regarding the rinse water which need to be taken into account: factors such as water hardness and temperature make a difference to how easy the rinse process is. Having the correct equipment can have an impact on how effective this process is. Water hardness is caused by minerals dissolved in the water. To be technical, water hardness is defined by the concentration of multivalent Cations contained within the water. The higher the concentration, the ‘harder’ the water. Typically, the cations contained within household water is determined by the rocks the water has passed through. The most common Cations found in hard water are CA 2+ (calcium) and Mg 2+ (magnesium). Central, southern and eastern parts of the UK have the highest concentration of cations, the most westerly sections of Devon, Cornwall and Wales, along with the majority of Scotland have the lowest concentrations. The effect of these ions is plain to see as a whitish build-up on bathroom shower screens and taps, inside kettles, coffee machines and irons as well as on windows that haven’t been ‘squeegeed’ off properly. When washing your vehicle, the effect is seen as white spot residues. 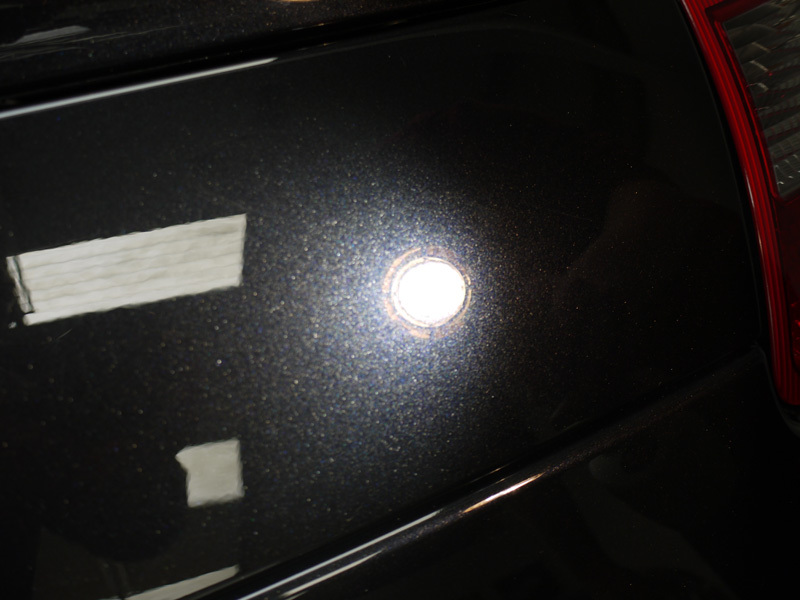 These bond to paintwork, become difficult to remove and in extreme situations, actually etch into the clear coat causing permanent marks which require machine polishing to remove. 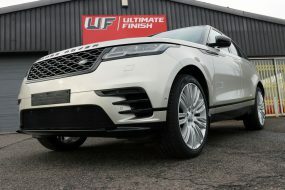 For the majority of the UK the only way to avoid the aggravation of water spot marks when washing your vehicle is either to ensure the car is thoroughly dried using a designated drying towel (Refer to 8.1 Drying Towels) as soon as the wash process is complete, or to use a de-ionising water filter (Refer to 7.1. Rinsing Your Vehicle With De-ionised Water). 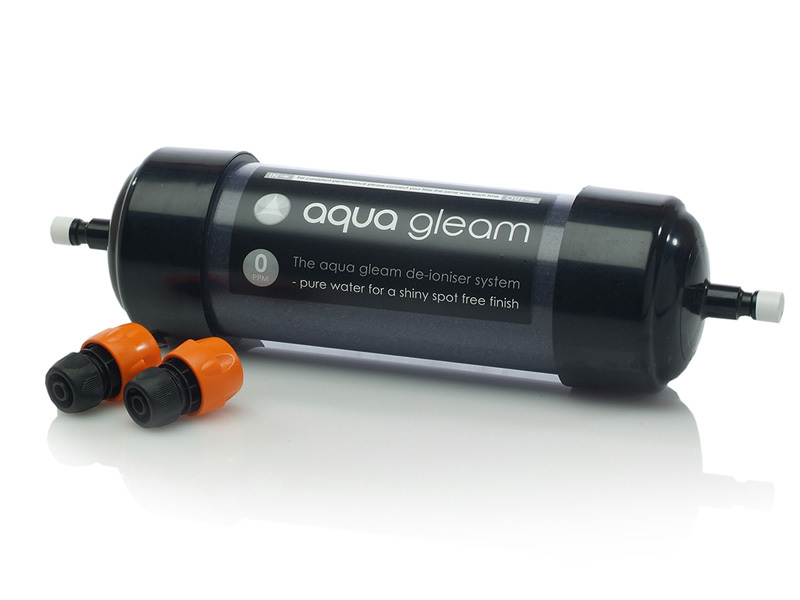 These filters contain a resin media which works through ion exchange to neutralise the Cations in the water, giving you a completely spot-free finish. The final stage of any car wash process is the drying process. Unless a de-ionising water filter has been used for the final rinse, the water will contain a number of mineral impurities which will leave unsightly deposits if left to evaporate. Certain evaporates will bond with the paintwork and become troublesome to remove, potentially etching into the surface of the clear coat and leaving permanent marks. To prevent water marks being deposited it is essential to dry the car immediately after rinsing, using a soft drying towel. 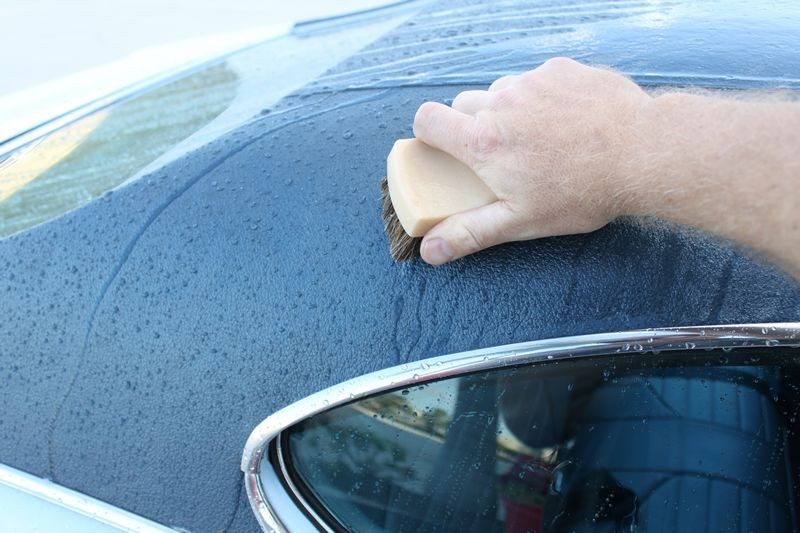 A traditionally accepted method of drying a car after washing is to use a natural chamois leather. Whilst chamois leathers are effective, being a natural product they are time consuming to look after and, if not properly cared for, have a tendency to rot. Synthetic chamois were introduced in an attempt to combat these issues but some fall short of the mark, being less effective at absorbing water and can be prone to leaving marks on paintwork and windows. In recent years the introduction of drying towels has revolutionised the process of drying a car. Much easier to wash and clean (they are usually machine washable!) more robust and longer lasting, the majority of car care enthusiasts have now turned to drying towels. There are two types of drying towel: the microfibre drying towel and the waffle weave drying towel. Microfibre towels have been used for quite some time for removing polish residues and buffing off natural carnauba waxes. 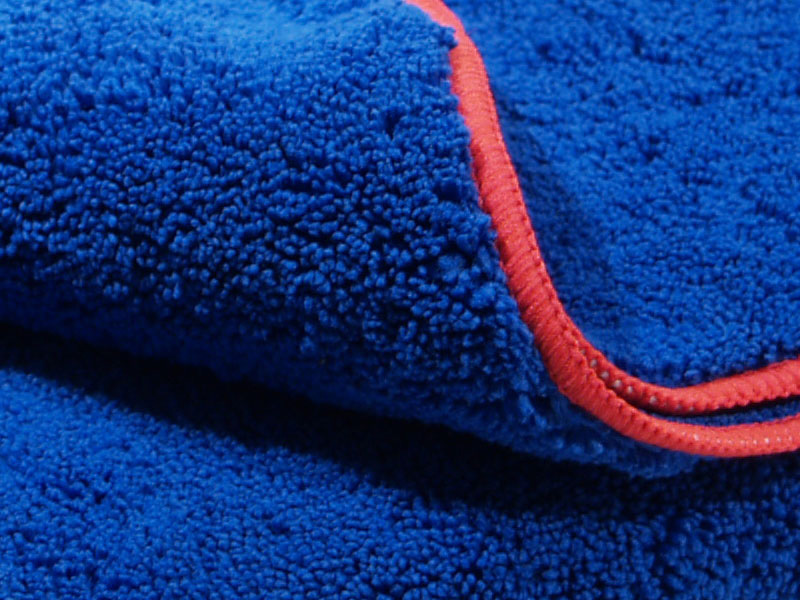 Microfibre towels are graded according to grams per square metre (GSM), the higher the GSM, the plusher the microfibre. Most quality examples are constructed from a polyester/polyamide mix – the higher the polyamide percentage, the softer the towel will be. The higher the overall density, the more absorbent the towel is likely to be. The over-woven fibres have their edges split in order to create the microfibre ‘catchy’ feel. Microfibre drying towels are typically significantly thicker than general purpose microfibres and are very soft to the touch, however some will require washing several times in order to fully ‘size’ them and to prevent linting (fibre loss) – a problem that will be particularly noticeable on darker coloured cars, especially if the drying towel is white! Like microfibre towels, these are also made from a polyester/polyamide mix, but the fibres have been woven in to a pique finish – literally – they look as though they’ve been created in a mini waffle iron – rather than having the edges of the fibres split. The absorbent cups created by the waffle indentations mean these towels have the ability to soak up huge amounts of water. When dry however, they feel less pliable to the touch than the microfibre version which can discourage some people from using them for fear of scratching the bodywork. Used correctly however, the waffle weave drying towel is a highly effective and very popular option. If drying a car with a chamois or drying towel seems hard work, an alternative is to use a touchless car dryer to force the water away from the paintwork. This non-contact method of drying your vehicle eliminates the chances of incurring scratches and swirls in paintwork usually associated with drying cloths and synthetic chamois. In addition, the powerful blast of air forces water from around trim, side mirror casings, badges and grilles, preventing irritating water marks and streaks. Touchless Car Dryers dry every inch of your vehicle quickly and effectively to leave a perfectly streak-free finish. Air dryers are particularly useful for ensuring that all remaining water has been dispersed from sticking points, such as around badges, grilles, metal trim and corners where rubbers and trim meet. 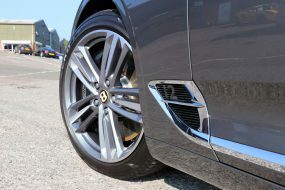 However, they can get very hot, so care should be taken to ensure rubbers and plastics are not over heated, particularly delicate plastic windows on cabriolets. If in doubt, use a drying towel (refer to 8.1 Drying Towels vs Chamois) in conjunction with a De-ionising water filter (refer to 7.1 Rinsing Your Vehicle With De-ionised Water) instead. Detailing clay is not, as the name suggests, made from clay! It is a man made combination of polybutene resin and abrasive particles and is designed to remove bonded contamination from the surface of paintwork, wheels and glass. Originally used by the body shop industry as a tool to remove over-spray from freshly painted cars, it is now an essential tool for the car care enthusiast looking for a superior finish! Clay comes in different ‘grades’ of abrasiveness and the correct grade should be selected depending on how contaminated the surface to be treated is. Clays depend on a lubricant to work effectively, some require a quick detailer spray and some work with just tap water. Detailing Clay is useful for removing bonded contaminants on paintwork such as tree sap, tar deposits, bug splatter and even brake dust spots. Badly contaminated surfaces typically require a more abrasive grade of clay to remove the contaminants, although a softer clay may do the trick and could take a lot longer! Select the finest grade of clay suitable for the job, as the more abrasive clays have the potential to introduce marring (marking) to paintwork, particularly if the paint is soft (refer to 10.5 How Hard Is My Paint?) . Most clay bars are available in blocks of 50, 100 or 200 grams. Cut the block into several segments – not only does this make it more manageable to work with it gives the added security that should you drop a piece on the floor you will still have some spare! All clay bars require a lubricant. Some use a standard quick detailer, some use tap water. Whichever you opt for it is important to ensure the surface you are working on is always adequately lubricated in order to ensure the clay slides easily over the panel. This allows the clay to work on the contaminants without abrading the paintwork. Clay can be used on most surfaces (paintwork, glass, metal, alloys) with the exception of textured trim. Before starting any claying process, it’s advisable to have decontaminated, washed and rinsed the car using previously discussed methods (refer to sections 1, 4, 5, 6, 7 & 8). If you drop the clay on the floor – THROW IT AWAY ! 9.2 Clay Lubricants – Water or Quick Detailer? All clay bars require a lubricant. Some can be used with water, some work better with a quick detailer spray (liquid suspension of carnauba). Always follow the instructions as noted on the clay bar – if the instructions say to use water, then it has been formulated with this in mind. If you try to use a quick detailer with it instead of water you may find the clay starts to break down and disintegrate in your hands. Equally, if the instructions for a clay bar say to use a quick detailer, then water will not suffice and you may find trying to use water with it will cause the clay to stick to the paintwork instead of providing lubrication. The single most important factor when claying is to ensure the surface being clayed is well lubricated. If there isn’t enough lubrication then the clay bar will mark the paintwork. Whilst this marring can usually be removed during the polishing stage it’s best to avoid making any additional work for yourself! 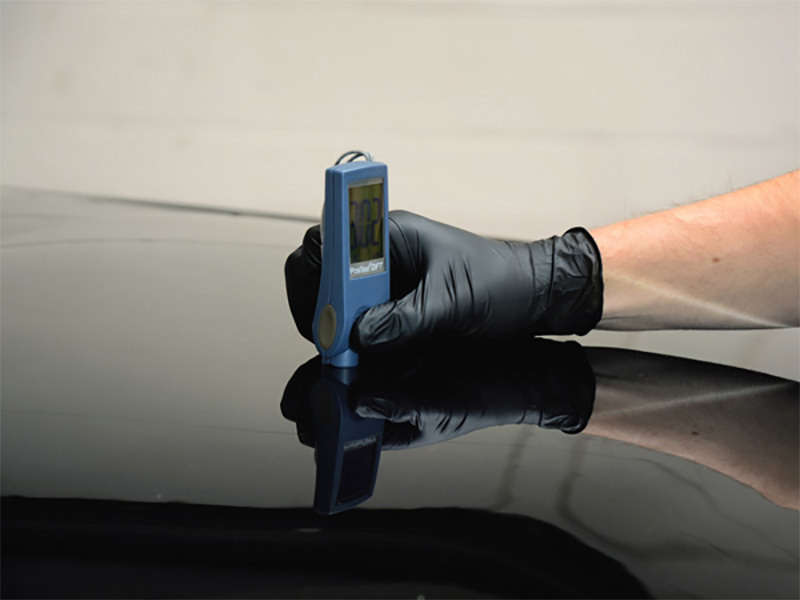 Prior to carrying out any kind of polishing it’s a good idea to thoroughly inspect your paintwork. To do this requires high intensity lighting, to properly illuminate imperfections. An understanding of the different types of blemishes and the extent to which you can impact their appearance is required along with an appreciation for the functionality of clearcoats. A little time spent researching these areas will potentially prevent expensive mistakes. Before starting the refining or correcting (polishing) process, it’s essential to have a clear picture of the condition of the paintwork and the blemishes that need to be addressed. Too often time is spent polishing paintwork to what appears to be perfection, only to take it into bright sunlight and discover a myriad of spider web-like swirls and or holograms. Lights list their intensity in lux and/or lumens, so it’s useful to understand the relevance. Lux is light intensity as perceived by the human eye and is measured in lumens. 1 lux = 1 lumens per metre squared. Full daylight is between 10,000 and 25,000 lumens. Direct sunlight is around 100,000 lumens. If your lighting source lists its ability in lumens or lux – the higher the number, the more imperfections it will show! Colour Rendering Index (CRI) is a measure of a light sources ability to discriminate between different colours. The maximum CRI possible is 100. A low CRI will render colours a different shade to their real colour. The higher the CRI, the more accurate the colour. Fluorescent lights of the types found in most garages and workshops have a CRI of around 50. LEDs have a CRI of around 80. However, a high CRI does not necessarily mean it will show up more blemishes on paintwork. Fluorescent lights work effectively for general purpose work, but tend to be too diffuse to adequately show up all of the inherent paint defects. Typically they are ceiling mounted. Halogen lights will only show up certain defects as they have a limited spectrum resulting in difficulty picking up subtle differences in colour. They also generate a lot of heat, so working under them for prolonged period gets quite uncomfortable. Typically they are available as one or two spot lamps mounted on tripods for easy positioning close to the panel being worked on. Metal Halide lights, although initially more expensive, last up to 30 times longer and are up to 4 times brighter than the equivalent halogen lights. They use 75% less power, making them an ideal choice for detailing studios. For close up inspection, a high quality LED torch (swirl finder) will focus an intense beam onto a specific area, with a brightness similar to direct sunlight. Ideally it will have a ‘fish-eye’ lens to focus the beam on to one area without causing a ‘dark spot’ in the centre – caused by a lack of overlap of light spill as a result of the positioning of the bulbs. A good LED will show up any particular areas that require further attention and allow you to accurately work on them. Before starting to correct and / or refine your paintwork by hand or machine, it’s a good idea to identify each problem and what you can realistically expect to achieve. Whilst many imperfections will polish out with the correct tools and techniques, others will not. This section is designed to define the different types of paintwork problems and give an idea as to what can be done to correct them. Oxidation – over time, harmful Ultraviolet (UV) rays make paintwork look dull and chalky – blacks appear grey, reds appear pink, etc. Oxidation was a particular problem for older paints – modern paint colour pigments are becoming increasingly sophisticated and new technologies mean clear coats have been engineered to better protect pigments. Oxidation can be removed using an abrasive polish working by hand or with a machine polisher. By hand will of course, take longer! 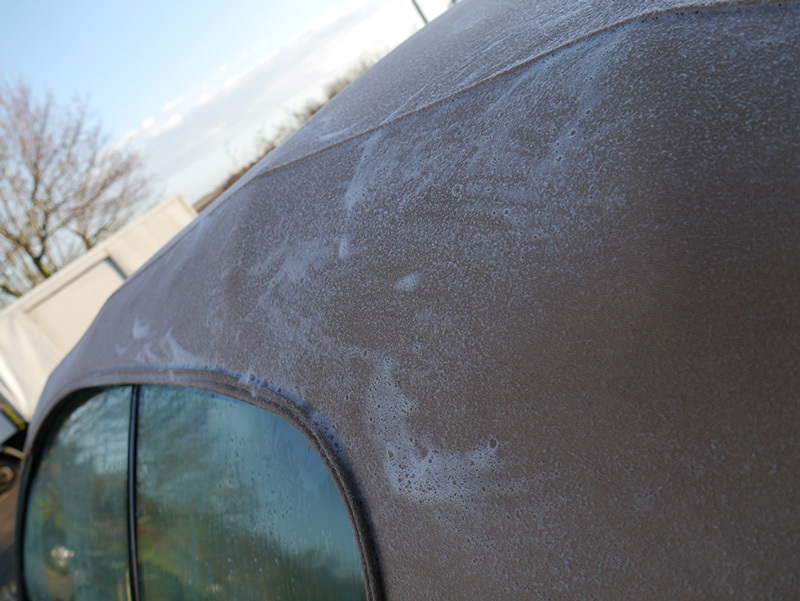 Swirl marks – usually incurred during the washing and drying process, or picked up whilst driving. Swirls present as a ‘cobwebbing’ pattern across the paintwork. The more cobwebs present, the more light is scattered. 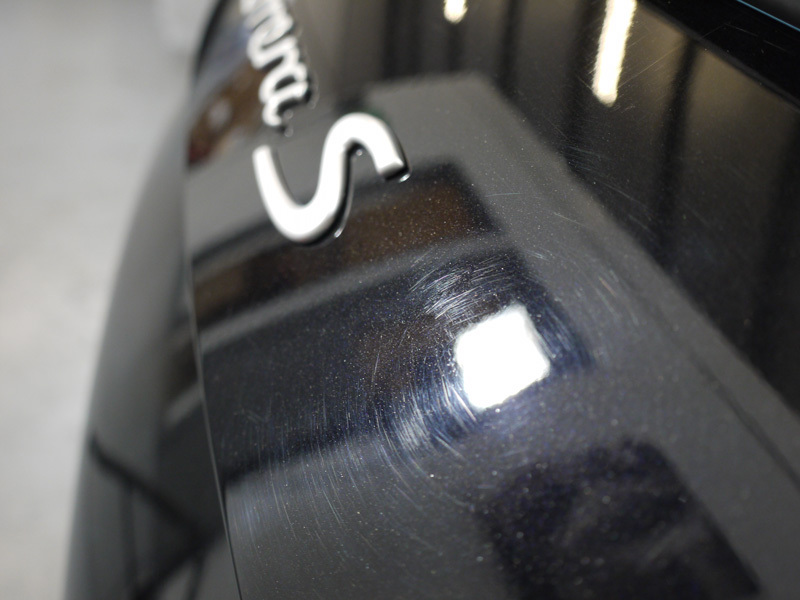 Swirl marks play a significant role in the loss of gloss from paintwork. Swirl marks can, dependant on the severity, usually be removed by hand with a suitable abrasive polish, however working with a machine polisher will give better results much faster. Fine scratches – present in the upper most layer of the clear coat, fine scratches are usually a result of dirt and grit being rubbed over the surface mainly during the washing and drying process, but can also be caused by dirt and dust whipped up by high winds. They’re usually defined as ‘fine’ if you cannot catch your fingernail in them. Fine scratches will normally polish out. If there are only a couple of fine scratches using a proprietary scratch remover will work well. 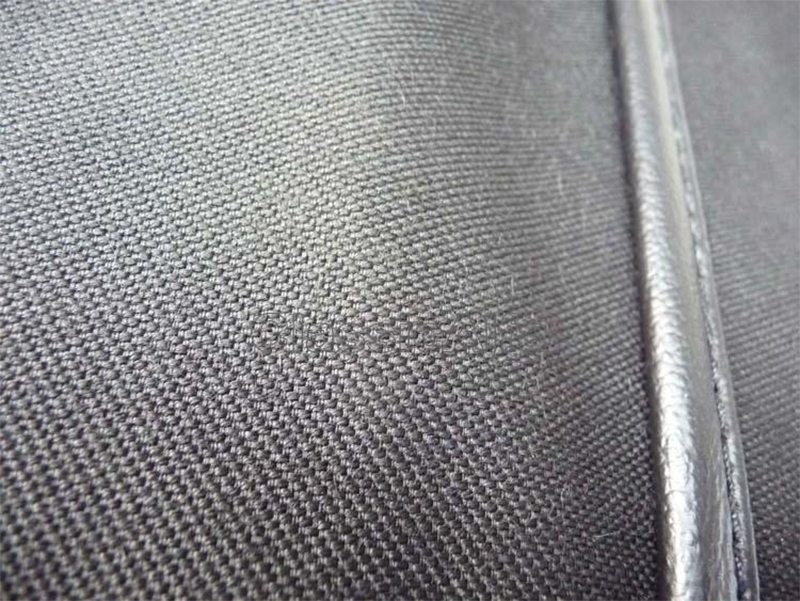 However, if the scratches are more prevalent then a machine polisher is a more able method of removing them. Random Deep Scratches (RDS) – these deeper grooves cut through the clear coat and paint colour, down to the primer or sometimes, even to the bare metal. RDS can be spotted easily and running a fingernail along will cause the nail to catch in the groove. 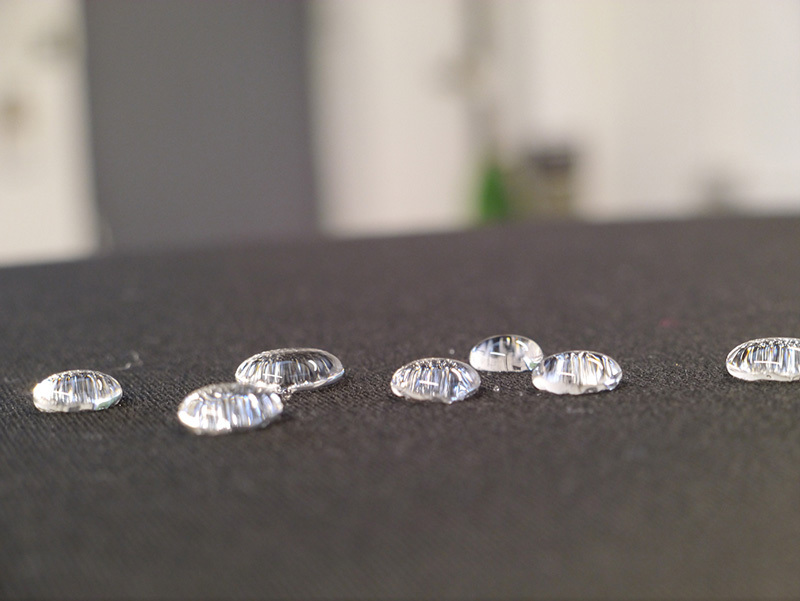 These types of defect cannot normally be machine polished out completely, however their appearance can be significantly reduced by rounding off the edges of the groove, thereby affecting the way they reflect light, minimising their visual impact. 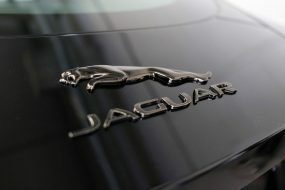 Holograms – also known as buffer trails, are caused by poor machine polishing techniques, even on brand new cars! These leave a blurry swirling effect on paintwork causing it to look dull and greasy. Holograms are usually fairly easy to remove using the correct combination of machine polisher, pad and compound. Attempts to remove buffer trails through hand polishing is unlikely to work. Stone chips – pitting in paintwork as a result of a high velocity collision of a hard stone with the bodywork. These present as fairly rounded spots and they usually look greyish white in colour – this is the primer showing through. Stone chips go deep to the primer and actually are the result of several layers of clear coat and paint having been dug out of the bodywork. These will not machine polish out. Specialist products are required to fill in stone chips to reduce their appearance. Bird dropping etching – birds usually do their business on top of fairly flat surfaces presented most directly to the sun. As paintwork is heated, it expands around the bird droppings and as it cools it contracts. This combined with the acidity of the droppings causes severe etching on the surface of the clear coat. Acid rain etching – acid rain is caused by sulphur dioxide and nitrogen oxide, produced as a result of fossil fuel combustion, volcanic eruptions or even lightning strikes – combining with water to produce acid rain. Carbon dioxide in the atmosphere combines with water to form carbonic acid. These all wash out of the atmosphere with rain and react with clear coats to leave irregularly shaped patches, visible most clearly in direct sunlight and on darker coloured vehicles. There are varying intensities of acid rain etching and whilst some will polish out with the right tools, if the rain has a particularly strong acidic composition or has been combined with some other factor, such as volcanic ash, there are occasions when this type of blemish will not polish out fully. The best way to guard against this type of damage is to ensure your vehicle has been protected with a last step product (LSP) such as a natural carnauba wax or a nanotechnology based glass coat sealant. 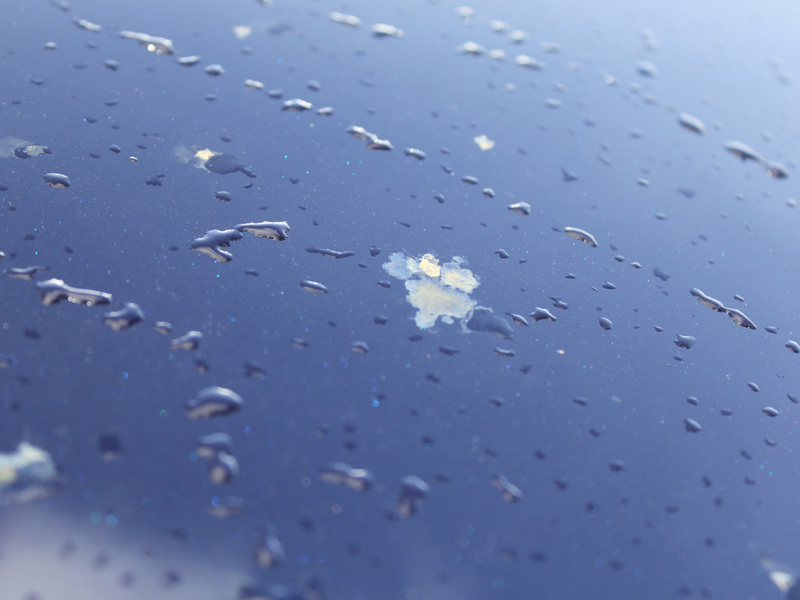 Water spot marks – PCC (precipitated calcium carbonate) from rain, or impurities in rinse water leave deposits on the paintwork if the vehicle is not properly dried. As with bird droppings, as paintwork expands and contracts around the water marks, the edges become etched into the clear coat and usually require machine polishing to remove. 10.3 Paint Thickness – Why Is It Important? Before commencing any form of machine polishing it is advisable that you know the depth of the paint. Some primer, paint and clear coat combinations are very thin, some are thicker. As machine polishing removes blemishes by removing layers of clear coat, it’s a good idea to know how much you have to play with to prevent accidental burn-through. Paint and associated layers are measured in microns. 1 micron = 1000th of a millimetre. Modern clear coat depths range from around 32 microns to 102 microns. Machine polishing will remove 2-3 microns of clear coat (unless very abrasive compound / pad combinations are used). This is usually enough to remove most imperfections (refer to 10.2. Understanding Paint Defects for further information). To measure your paint use a Paint Depth Gauge. There are many different models available and typically, the more sophisticated the gauge, the higher the price tag. All of them give the reading for the clear coat and the paint layers combined. Some gauges only work on painted steel panels, others will work on other, non-conductive substrates such as brass, aluminium and plastic – particularly handy if you have colour coded bumpers or a ‘plastic’ car, such as a Smart car! Taking paint depth readings can yield some surprising results, particularly if the car was bought as a ‘used car’. Sometimes a panel will give a thicker paint depth reading, indicating a previous re-spray – something that may not have been revealed at the point of sale. 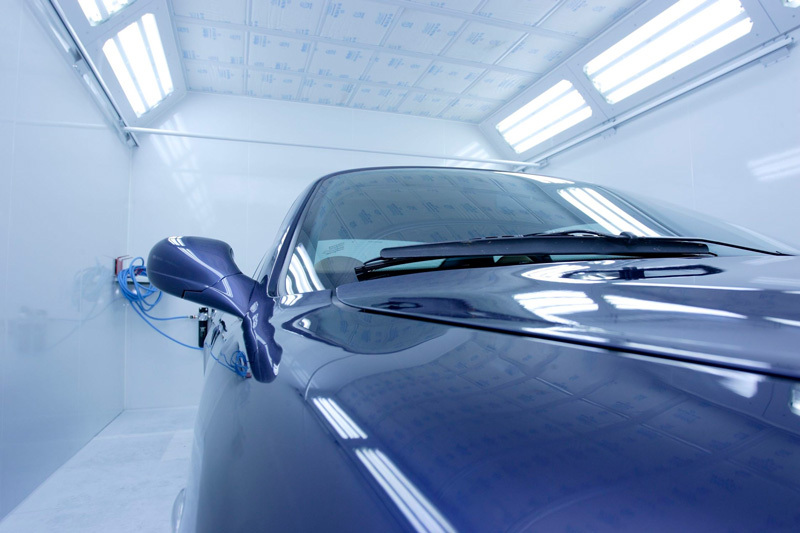 Clearcoat Lacquer is the final layer that is applied to the painted surface of your vehicle. Typically it is between 32 and 102 microns in depth and its primary function is to protect the underlying paint base colour. Clearcoat has to be chemically stable when exposed to UV radiation, it has to provide gloss and it has to cure hard enough to offer some protection from swirls and scratches. Modern clearcoat technology is advancing rapidly and the age of self-healing clearcoats is not that far away. In the meantime, understanding how present-day clearcoats function is important prior to picking up a machine polisher. Clearcoats are colourless – the colour of your car is determined by the paint layers underneath the clearcoat. This transparent layer has to combine the elements required to provide scratch-resistance, UV stability and gloss, all into one solution. Significantly, the elements used to provide UV resistance are lighter than the other elements, so as the clearcoat cures the UV resistant elements naturally rise to the upper layers whilst the heavier elements settle towards the bottom. Each time a clearcoat is machine polished, around 2 -3 microns of the upper part of the clearcoat is removed. It doesn’t take much machine polishing before the UV protective elements start to become degraded. Additionally, many car marques actually state paint warranties are invalidated if more than 25% of the original clearcoat has been removed. This means if the clearcoat is 80 microns thick, only 20 microns needs to be removed before the warranty is voided. If machine polishing session removes 3 microns – six or seven machine polishing sessions could conceivably void the warranty! This should be taken in to account before too much enthusiastic machine polishing begins!